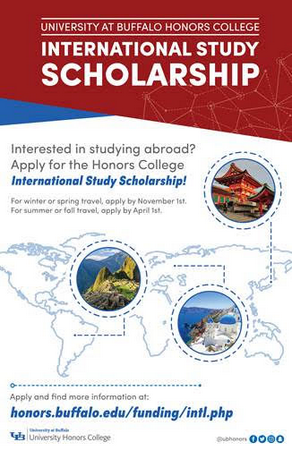 Learn about all study abroad opportunities available in the SUNY system! Catalyzing collaboration around health, social innovation & STEM education. In the exciting world of high-impact experiential learning, relationships are everything. UB faculty and staff have amazing partnerships with institutions and regions all over the world. By building on these partnerships we can engage faculty, students and community members in ways that will result in deep and lasting impacts. The GPS Institute represents an innovative vehicle for traveling farther and deeper with our international partners. We have designed the Institute to transform existing global partnerships into catalysts for new high-impact experiential learning. As a result of the Institute, we will have a portfolio of evolving courses, projects, and engagement opportunities. Since faculty are essential to student learning, we hope to engage UB faculty from diverse disciplines and areas of study to explore synergies toward curricular innovation. And since experiential learning can be a driver for community impacts, we are committed to supporting our partners in their own professional development and capacity building during their time at UB. ELN is transporting Global partners to UB for a week of high impact sharing, collaboration and capacity building. This year’s inaugural institute, taking place October 1 through October 5, will focus on catalyzing collaboration around health, social innovation & STEM education with partners from Ghana, Jamaica, Tanzania and Zimbabwe. This open session will feature partner presentations that provide context and a framework for engagement and collaboration throughout the Institute and beyond. Audience Q&A is encouraged. Learn about our honored guests and explore their backgrounds, affiliations and areas of focus at the opening reception immediately following the partner presentations. Learn more about GPS platforms and resources for igniting global partnerships, deepening collaborative relationships, sharing innovations with broader communities and more. Identify and meet with partners of interest to discuss ideas for engagement and collaboration. Submit your idea for collaboration to receive follow-up support offered by ELN staff and partnership sponsors. Join us for a celebration of the emerging ideas for engagement and collaboration and help us wish our global partners farewell. Learn more about the hundreds of study abroad programs available to UB students. UB faculty and staff will be representing their faculty-led study abroad programs. 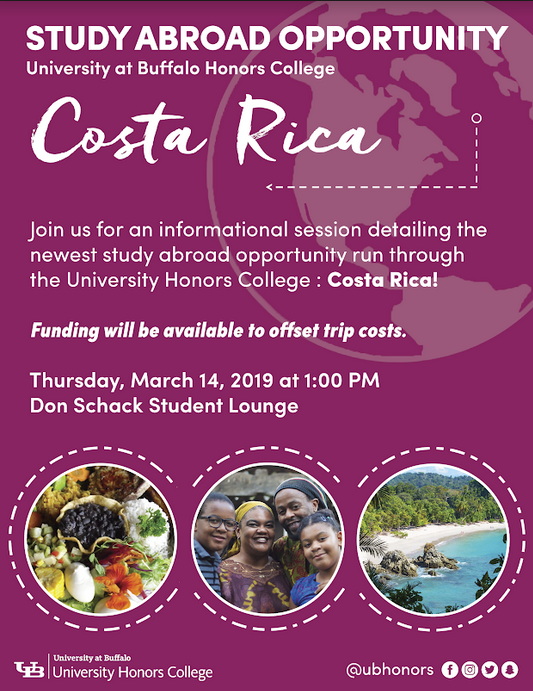 Additionally, representatives from other SUNY campuses will be on site to advertise the study abroad programs they sponsor (and which are available to UB students). Come chat with students who have studied abroad and learn how you can fit studying abroad into your degree program at UB! All undergraduate students majoring in a health profession should explore this exciting opportunity to study abroad and gain hands-on learning experience in their field while being immersed in Jamaican culture. Topics of this winter session class will include: link between sedentary/poor diet, obesity and chronic disease; healthcare disparities in a developing country; comparison of medical models in the United States and Jamaica. Social Innovation and Entrepreneurial Leadership Costa Rica and Nicaragua study abroad program for undergraduates. 15 Credits: 6 Global Perspective (Thematic) credits, 6 Management Elective Credits and 3 credit practicum. Send your resume, unofficial transcript and a paragraph of how this opportunity will further your academic and professional experience to sbosch@buffalo.edu.